Venetian apartments ... ready for handover. 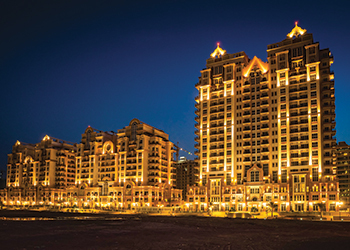 Dubai Sports City (DSC), a 50-million-sq-ft mixed-use development, has started handing over apartments within its flagship development Canal Residence West’s Venetian in Dubai, UAE. The DSC move comes following the successful completion of the first phase of hand-overs involving Canal Residence West’s European and Mediterranean buildings and it further builds on the population at the development where an extra 5,000 residents are expected to move in over the next 12 months. The 274 Venetian units being handed over include studio, one-, two- and three-bedroom apartments and are finished to an extremely high standard as well as offering numerous amenities including a swimming pool, gymnasium and sauna facility. During the summer, the Canal Promenade retail outlets will be completed, as well as a health centre and restaurants, further enhancing the environment for residents, says Khalid Al Zarooni, DSC president. Each apartment in Canal Residence West comes with the benefits of living within DSC such as a superb community lifestyle, with The Els Club – including its championship golf course and multiple dining options – on the doorstep, together with a range of nurseries and schools that cater for all ages, he adds. Chief financial officer Vijay Sajjanhar comments: “Those lucky enough to live at Canal Residence West are just a stone’s throw away from the ICC Academy, the Dubai Sports City Football Academy, the Sports Village and Fit Republik, a premier fitness facility in the region, which includes an Olympic-sized swimming pool and gymnastics area. Also moving forward at great pace is the Fortuna Village development – the eighth residential area within Victory Heights, the villa community that fringes The Els Club – which is on target for completion early next year, he states. “With a fantastic road and transport infrastructure around our location, situated on the Sheikh Mohammad Bin Zayed Road corridor, and just minutes from the Al Maktoum International Airport and the site of Expo 2020, Dubai Sports City really is the place to be,” he adds.